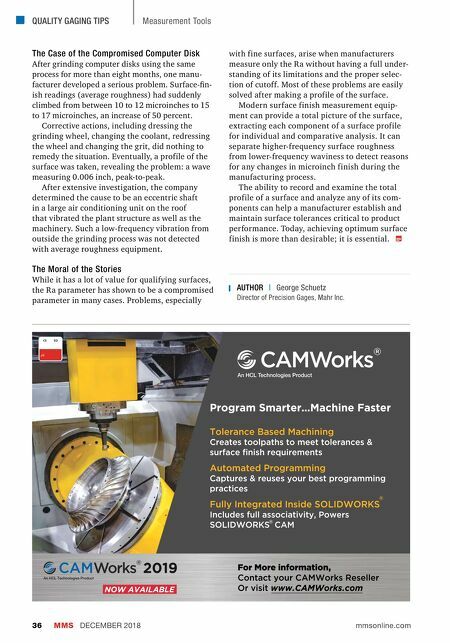 MMS DECEMBER 2018 36 mmsonline.com QUALITY GAGING TIPS Measurement Tools AUTHOR | George Schuetz Director of Precision Gages, Mahr Inc. The Case of the Compromised Computer Disk After grinding computer disks using the same process for more than eight months, one manu- facturer developed a serious problem. Surface-fin- ish readings (average roughness) had suddenly climbed from between 10 to 12 microinches to 15 to 17 microinches, an increase of 50 percent. Corrective actions, including dressing the grinding wheel, changing the coolant, redressing the wheel and changing the grit, did nothing to remedy the situation. Eventually, a profile of the surface was taken, revealing the problem: a wave measuring 0.006 inch, peak-to-peak. After extensive investigation, the company determined the cause to be an eccentric shaft in a large air conditioning unit on the roof that vibrated the plant structure as well as the machinery. 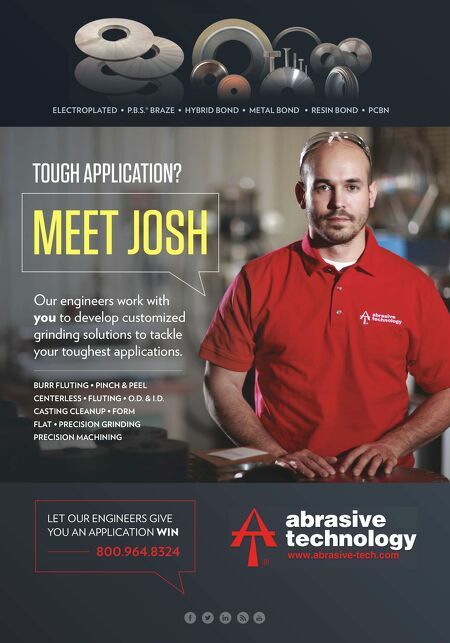 Such a low-frequency vibration from outside the grinding process was not detected with average roughness equipment. The Moral of the Stories While it has a lot of value for qualifying surfaces, the Ra parameter has shown to be a compromised parameter in many cases. Problems, especially with fine surfaces, arise when manufacturers measure only the Ra without having a full under- standing of its limitations and the proper selec- tion of cutoff. Most of these problems are easily solved after making a profile of the surface. Modern surface finish measurement equip- ment can provide a total picture of the surface, extracting each component of a surface profile for individual and comparative analysis. It can separate higher-frequency surface roughness from lower-frequency waviness to detect reasons for any changes in microinch finish during the manufacturing process. The ability to record and examine the total profile of a surface and analyze any of its com- ponents can help a manufacturer establish and maintain surface tolerances critical to product performance. Today, achieving optimum surface finish is more than desirable; it is essential.